With new perspectives on operational and tactical choices by commanders, the experiences of common soldiers and civilians, and the significant role of the United States Colored Troops in the fighting, this book is a must-listen for all those interested in the history of the Civil War. 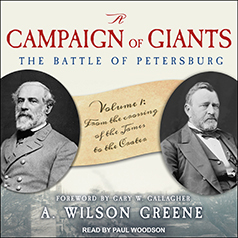 Here A. Wilson Greene opens his sweeping new three-volume history of the Petersburg Campaign, taking listeners from Grant's crossing of the James in mid-June 1864 to the fateful Battle of the Crater on July 30. Full of fresh insights drawn from military, political, and social history, A Campaign of Giants is destined to be the definitive account of the campaign. With new perspectives on operational and tactical choices by commanders, the experiences of common soldiers and civilians, and the significant role of the United States Colored Troops in the fighting, this book is a must-listen reading for all those interested in the history of the Civil War.